In case of food baby, break out the long shift dress. I have like 3 of these dresses for when I don't feel like wearing anything fancy but want to be put together. I picked this one up during the last Madewell sale and I love it. 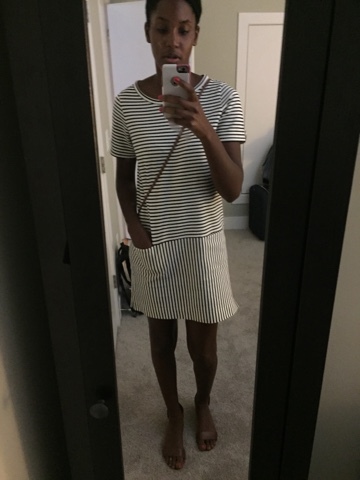 The fabric is thick, it has pockets and there are two different directions for the stripes. I added some heels to make my legs look extra good and a matching bag. We went to dinner at Taco Luchador and I have to review it because it is bomb.